Meerschaum is a white, porous, brittle rock that has been mined and hand-carved into intricate smoking pipes, often into shapes like mermaids or sea captains. Meerschaum is rare; it is only found in mines dotting the plains surrounding the Turkish city of Eskishehir. Meerschaum pipes are highly prized by collectors due to their rarity, beautiful color, carvings and the fact that, unlike briar pipes, they don’t burn and can be smoked multiple times per day. When purchasing a meerschaum pipe, there are several ways to tell if it is real or fake. Examine the stem and mouthpiece of the meerschaum pipe. Check if the stem is made of cherry wood and the mouthpiece out of horn – this indicates the pipe was made from pressed meerschaum rather than carved out of one solid piece like a real meerschaum pipe. 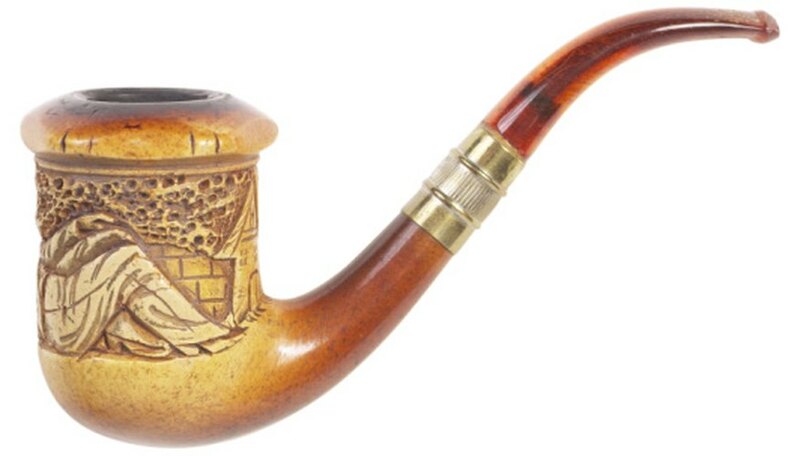 Look for a seam running along the bottom of the bowl, and check the stem of the pipe for the signature of Gustave A. Fischer. If the pipe has a seam, it’s made from pressed resin, and Mr. Fischer never signed his pipes. Examine the color of the pipe. Real meerschaum pipes absorb tobacco tar and oil, which is wicked to the surface by a beeswax coating. Over time a meerschaum pipe's color turns from creamy white to a rich golden brown or cherry. Check for any “burn out” places on the bowl of the pipe. Real meerschaum doesn’t burn. Rachel Spradling is a writer and editor with over 14 years of experience writing everything from political commentary to training manuals. She graduated from California State University, Chico with a Bachelor of Arts in English. Spradling's work has appeared in "CitiZen" magazine, "Watershed" and "News and Review."